…Wolfgang Puck, American Chef, Restaurateur, and Occasional Actor. Food Production and its related operations are integral elements of hospitality management, hotel management, and restaurant businesses. It requires a skilled staff who can produce a wide variety of quality foods. 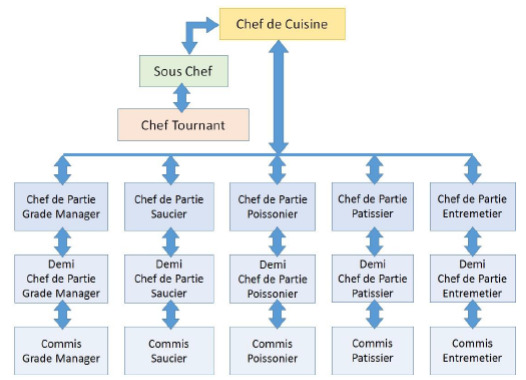 In addition, the culinary staff of a hotel or a restaurant is also required to produce food in a large quantity. Let us start with understanding the basic term ‘Cookery’ in detail. 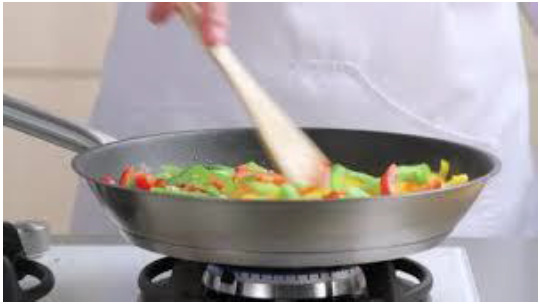 Cookery is an art and science of preparing food for consumption by using heat. Cookery is an age-old practice. A primitive human must have found a piece of meat or vegetable cooked in the bushfire by chance. He must have found it edible, chewable and easy to consume. Probably, he even must not have cooked deliberately until he knew how to create fire. The simplest method of cooking was holding a piece of meat or vegetable in the fire directly, which is still in practice, with a little sophistication. From the age-old cooking practices to cooking for fine dining, cookery has come a long way with the evolution of humans, their skills, diverse cultures, and the equipment. Today, cookery is an inseparable part of our lives that rules our tongues and hearts. We can have some foods in the raw form too, such as salads and fruits but we need to cook certain foods such as beans and meat to make them edible. In addition, if we eat some vegetables without cooking, they can transfer harmful bacteria or substances into our bodies. For example, uncooked beans contain anti-digestive enzymes. Uncooked capsicum (Bell Pepper) contains Capsaicin that can create burning of stomach lining. Cooking helps to destroy unwanted substances present in the food and unwelcomed effects of consuming it. To make the food digestible. To kill any harmful bacteria present in it. To make appearance of the food pleasant. To change its physical and chemical form. Let us now see the organization of the Kitchen Department. Since a large quantity and variety of food is produced in the professional kitchens, various designs are considered before setting up a kitchen. The food production managers must consider the following factors with respect to the kitchen. 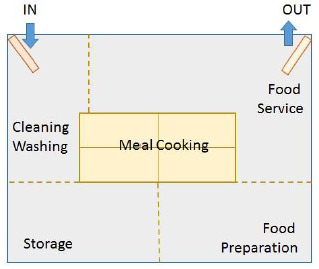 Some typical layouts of a commercial kitchen are given below. In this type of layout, the cooking ranges, ovens and other cooking equipment are placed together at the center of the kitchen. The other sections are placed along the wall in order to follow a concentric design. Any section can be an island depending on the requirements. It is an open layout that favors staff communication. It also leaves an adequate open floor space for cleaning. This layout is followed in large kitchens. 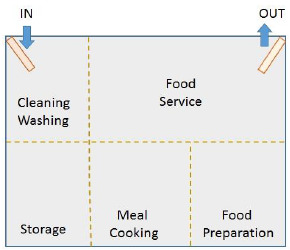 The total kitchen space is divided into different zones for various activities. The principle equipment are located along the walls. This layout follows an appropriate order. In this layout, staff communication and supervision are easy as the central space is completely open. In this layout, kitchen equipment is organized in a row. 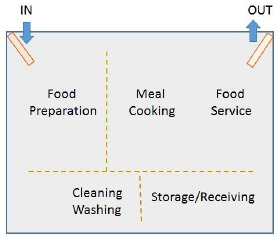 The food preparation space is kept at one end and the service space at the other. The areas for cleaning/washing and storage/receiving are behind the assembly line to keep them separate from the main busy space. This allows the cooks to send the food quickly down the line. This layout provides very high efficiency, and excellent communication and workflow. This layout is very effective in case of the establishments with a limited menu with large momentum.